Last night's joint work session between the Board of Mayor and Commissioners and the Downtown Development Authority sought public input on the future of land owned by developer Euramex and the City of Avondale Estates. At the request of the Mayor Jonathan Elmore, a team of residents with backgrounds in planning and urban design drew potential layouts for the downtown area. 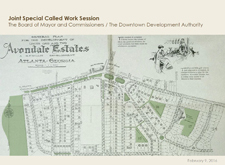 A Power Point presentation of five different schemes was given by John Threadgill and can be viewed here.